Here is the progress made on the old Peterborough. 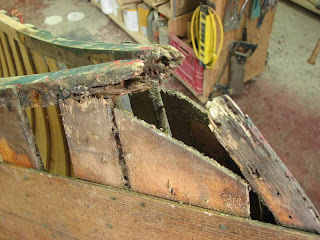 I have the planking opened up for the broken ribs, recesses chiseled out, and splines made to rebuild the broken wood. ...because this needs to be attended to. While this looks pretty drastic as far as damage goes, its actually pretty common. Over the years condensation collects on the canoe. 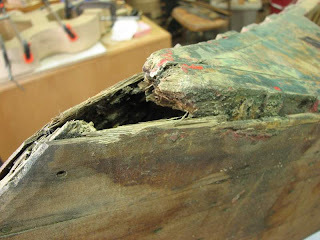 Even though the canoe is stored upside down, this condensation collects and stays longest where there is the least drainage and air flow for the wood to dry. Slowly, slowly, over the years, the rots sets in and this is where it usually does its worst. So I remove the decks and open up the planking to allow me access to work here. 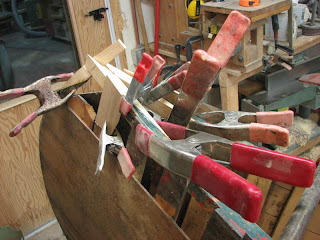 And I prepare new wood to match the existing wood and use epoxy to bond it in place. 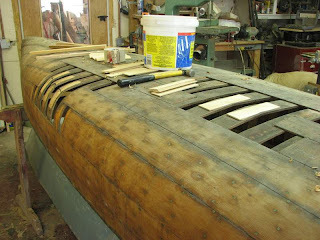 Four gunnel ends, two stem ends, and five rib ends. Could have been worse. While the decks are out I repaired them as well. Next step is to clean up the new wood and match it to the existing structure, put the planking back on, and close up the ends. Posted by Doug Ingram at 8:46 a.m.